Reductions in heating and cooling energy consumption can be achieved by using high-efficiency equipment, improved insulation, high-efficiency windows, as well as systems that utilize solar energy for capturing and storing heat as well as ventilating the building itself. Water heating energy consumption can be cut down by using heat recovery systems on waste water and by using high efficiency water heating equipment. Electricity and lighting energy consumption can be cut by minimizing standby power, using energy efficient appliances, utilizing daylight through sun roofs and windows, and by using highly efficient fluorescent and LED lights. 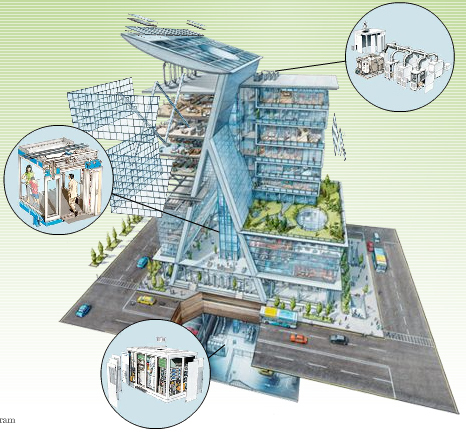 Recycling heat that is generated from large appliances, using absorption chillers to cool the building, and thoroughly insulating these buildings are key ways to cut down energy consumption. Solar cells and wind turbines can be used to generate electricity to sustain the buildings’ needs, while biofuels and solar collectors that are linked to seasonal thermal stores can be used for heating the buildings. When striving to have buildings with a net energy consumption of zero, or even those that generate more energy then they use, it is important to focus on both energy conservation and energy generation. In other words we most improve the efficiency in which we use energy while working on finding renewable and eco-friendly sources of generating energy such as solar and wind sources. With buildings taking up a large portion of the world’s energy consumption, it is an important issue for us to strive towards net zero energy buildings in our near future. You might be qualified for a new government solar rebate program.